A new survey of 8,500 secular voters reveals a bloc of highly educated, frequent voters determined to counter the Religious Right’s hold over the U.S. government and who would strongly support nonreligious candidates. The Freedom From Religion Foundation (FFRF) conducted the digital survey of registered U.S. voters in early October to help educate the public about secular voters in advance of the 2018 midterm elections. According to Pew Research, one-quarter of Americans and one-third of Millennials are now nonreligious, but of the 535 members of Congress, only one -- California Rep. Jared Huffman -- is openly nonreligious. 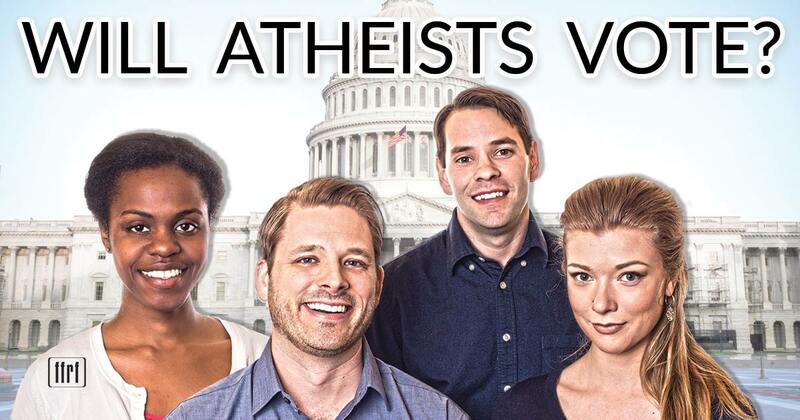 When asked why so few atheists or other nonbelievers are serving, more than half of FFRF’s respondents cited widespread discrimination against atheists, and more than a third cited a belief that many atheists are secretly serving in government but too afraid to come out of the closet. Respondents reacted positively to learning about the 10-member Congressional Freethought Caucus launched earlier this year. On a scale of 0 to 100, respondents averaged a 90 when asked how likely they would be to support candidates who openly identify as nonreligious. Respondents said the Congressional Freethought Caucus should prioritize mandating science-based education in schools, ending tax breaks for all churches, and protecting women’s health care against religious zealots. When asked what is the most dangerous threat to the separation of church and state in America, the top response was President Trump’s Supreme Court nominees, followed by “Religious Freedom” bills advancing in state legislatures across the country. Nearly three-quarters of secular voters identify as atheists, with 13 percent identifying as humanists and 6 percent as agnostic. More than one-quarter are Democratic Socialists, 45 percent are Democrats, 22 percent are independents and less than 2 percent are Republicans. The vast majority are supervoters, stating they vote in every presidential, midterm and local election, including most primaries. Nearly two-thirds hold a college degree or multiple degrees, with just 6 percent having not attended any college. The largest group of secular voters are middle-aged-whites, a coveted swing demographic cited by many national political pundits and campaigns.